This pamphlet is a project of The TLC Foundation for Body-Focused Repetitive Behaviors Scientific Advisory Board. 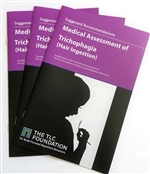 It is meant to be used as an overview of trichophagia, providing some advice, recommendations, and resources for sufferers, families, and professionals. It is not intended to provide treatment for body-focused repetitive behaviors or trichophagia. Appropriate treatment and advice should be obtained directly from a qualified and experienced doctor and/or mental health professional.